I’m an ICU RN and I specialize in critical care. I pride myself in being there for those who need me most, those on the brink of losing everything. 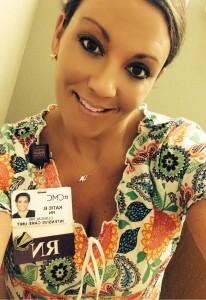 When I take my RN name tag off, I’m the mother of two amazing kids. These two children are my beating heart. April 21, 2015 started as a typical day. A beautiful spring day in New England. I woke up, got my family up and off to school. I did simple house chores and took a trip to the gym. It all seemed like a normal day, but then, all of a sudden, it wasn’t. While what happened next I can’t recall on my own because I only recall small snippets, the last thing I remember from that night was getting ready for bed. I can see as clear as day, visions of my love brushing his teeth then the next thing I know, I have a paramedic yelling my name in my face. I found myself in the back of an ambulance with everyone staring at me. All I can ask is, “What’s going on?”. Fast forward to my next memory, I open my eyes and I’m in the ER. I see the ER doctor, my love and the nurse. I can’t stop wondering why my head hurt so badly. Those moments were broken up by inability to stop vomiting. Then the ER doctor finally told me “You had a brain hemorrhage from a brain aneurysm, Kate”. Then, the nurse in me kicked in. I’ve seen this before and it doesn’t always end well. As clear as day, I remember looking at my significant other and having this one moment while I was alert to tell him what my wishes were. I said “I know how this plays out and I’m going to die. I’m going to die. Promise me, that if I can’t be a mother to my children, you let me go. Promise me”. My next memory was waking up days later and I was alive. I was transferred by Medflight to Mass General Hospital where a surgeon named Dr. Patel saved my life. My significant other told me that my neurosurgeon said that if I was lucky enough to survive this, I’d never go back to nursing. Something he asked that I never hear for fear that if I heard this, I’d stop fighting. I was alive, but faced more hurdles. During my recovery, I suffered a stroke. I required a high volume lumbar drain, EMGs, countless CTs. I worked hard with physical therapy and occupational therapy as I relearned how to walk. With pain management, I was finally discharged home. Standard follow up testing revealed I needed a craniotomy, which I had 6 months later. A few months after that surgery I needed a VP shunt placed for hydrocephalus. Despite all of that, I made it. One of the most challenging parts of being a survivor is that you look the same, but you’re not the same. You’re not the person you were before you got sick. But I am so grateful to be alive – and back to nursing! An experience that made me a better nurse and person. The Joe Niekro Foundation would like to thank Katie for sharing her inspiring story with us and our community, we’re so glad she was able to return to her job as a nurse!